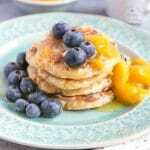 Easy to make mango pancakes are fruity, delicious and a real treat. Start the day as you mean to go on with this wow-factor ten breakfast! As an occasional weekend treat, there’s little to beat a stack of fluffy pancakes, dripping with butter and maple syrup. These mango pancakes are doubly delicious with mango compote both in the mixture and spooned on top. 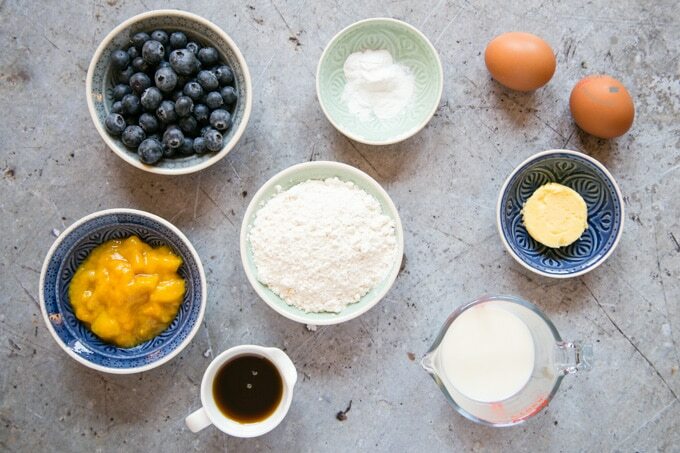 The secret with American-style breakfast pancakes is to use regular soft cake flour (never bread) and to mix the batter gently. Don’t beat it quickly, or even worse use an electric whisk; for a light and fluffy result you don’t want to develop the gluten. Unlike muffins, however, you do want to make sure that the mixture is properly combined. If possible, leave the mixture to stand for about 30 minutes between mixing and cooking for the best results. 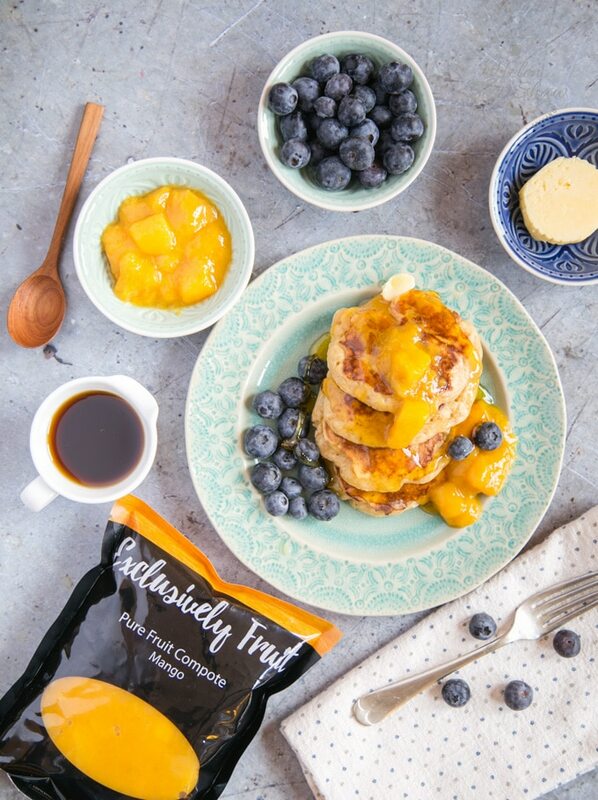 Our secret ingredient for these mango pancakes are these delicious compotes from Exclusively Fruit who make these compotes from 100% fruit, adding a little apple juice for sweetness and fruit pectin for texture. Choose from mango, strawberry, apricot or mixed berry. 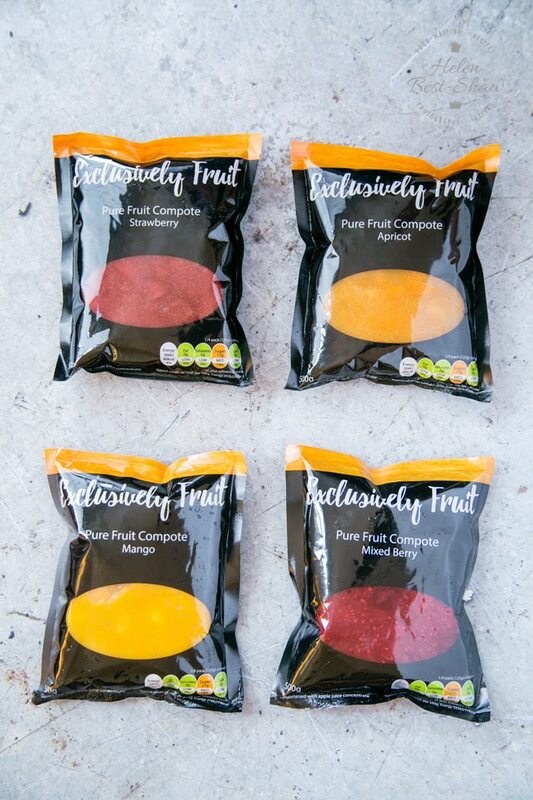 The compotes come frozen in handy 500g pouches, at £3.50, each with free delivery if you order 24 or more pouches. As well as being free from from refined sugar and any other additives and preservatives, they are suitable for vegan, gluten-free and dairy-free diets. 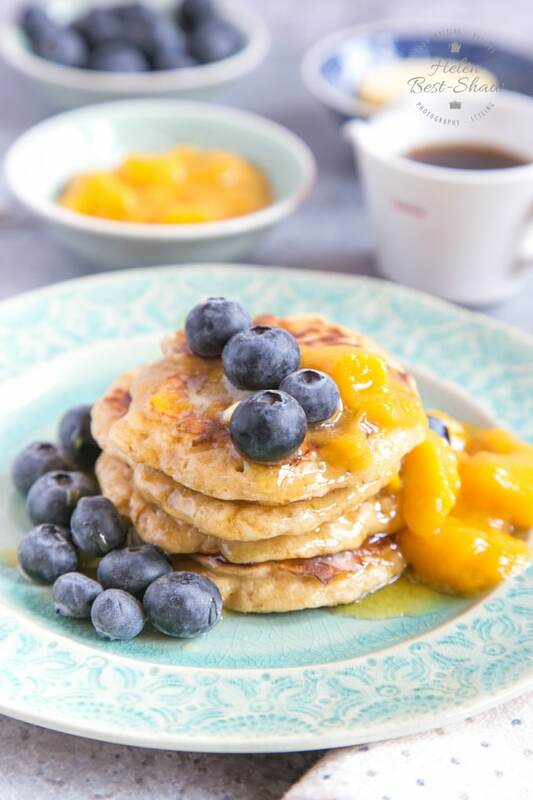 We love them; as well as using as an ingredient in these pancakes (the apricot would work just as well as the mango) we have been using them as a porridge or overnight oats topper, layered with yogurt and granola in a breakfast parfait and enjoying over a scoop of ice cream or sorbet. They make it really easy to add some fruit to your meals. Simply take out of the freezer the day before you want to use them and allow to defrost in the fridge overnight. One pouch is enough to last two of us a week as a breakfast topper. Step One – Measure out the ingredients. I have found that this is such a good habit to get into, saving time and greatly reducing mistakes and hassle later. Step Two – Mix the dry ingredients together. 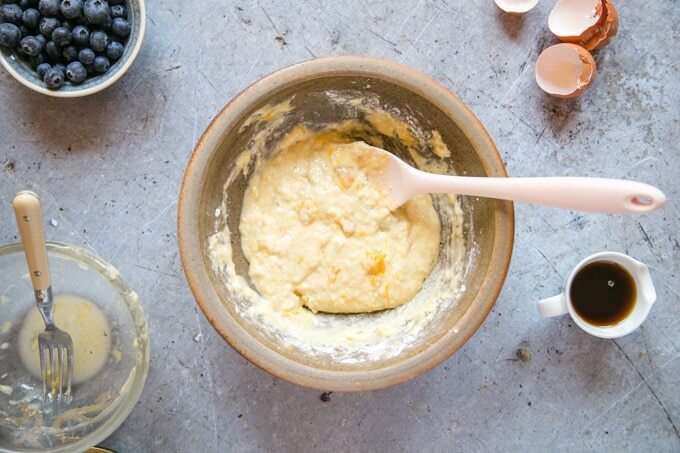 In a bowl, whisk the milk, mango compote, and eggs. Melt the butter, and stir into the milk mixture. Step Three – Add the liquid to the dry ingredients, and fold together gently. 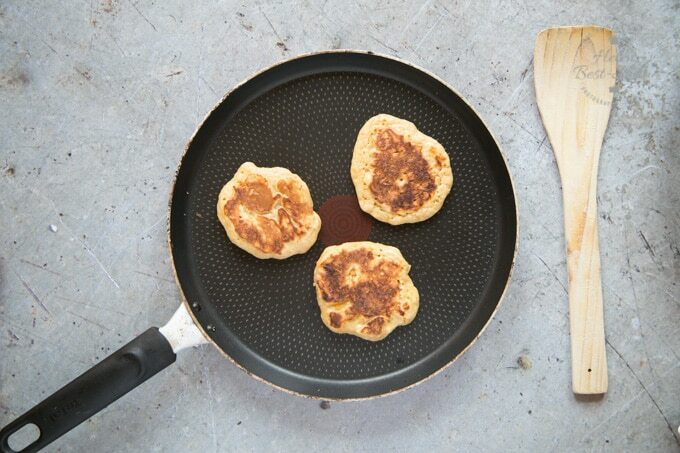 For the lightest and fluffiest pancakes, you don’t want to beat the batter quickly, that will develop the gluten and give tough, heavy pancakes. Step Four – Gently fold the batter until it’s all mixed. Ideally, let it stand for about half an hour before cooking the pancakes. Step Five – Heat a frying pan over a low to medium burner. Using a piece of kitchen paper, wipe the pan with a little butter (about the size of a pea). Spoon a tablespoon of batter per pancake. At the same time, place a dish in a low (120C/GM1) oven. Step Six – let the pancakes cook. When bubbles appear on the top, they’re ready to turn. Step Seven – Flip the pancakes, and let them cook until golden on both sides. Step Eight. 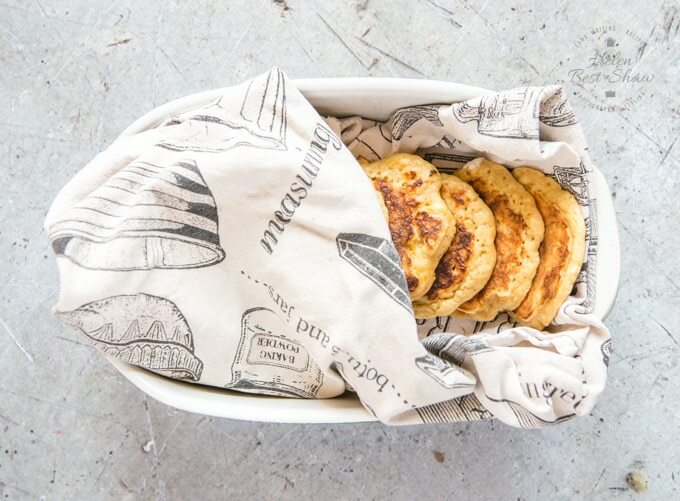 To keep pancakes warm until ready to serve, keep them in a low oven wrapped in a tea towel/dish towel. This stops them drying out. Serve stacked high with butter, maple syrup and blueberries as well as an extra dollop of compote. 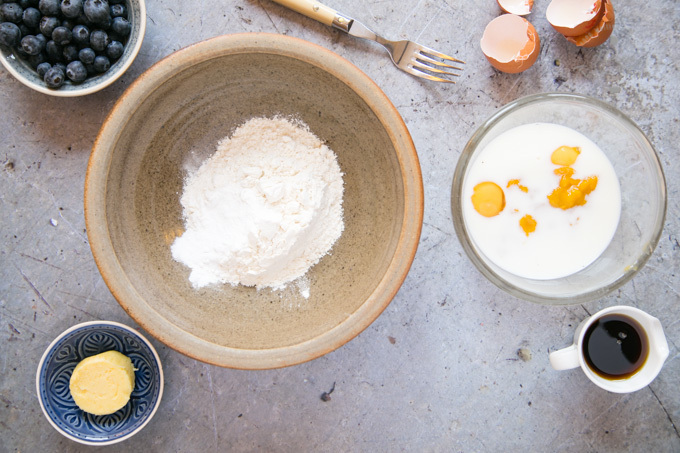 Because of the mango compote these are never going to be super light and fluffy, there are a few things to do to help you make the best pancakes. Use soft flour – so cake flour – NEVER strong bread flour. Mix the batter just enough so it is smooth, if you over mix you will overdevelop the gluten and this can make the pancakes tough. Use fresh baking powder. Baking powder has a shelf life of 9-12 months before it loses its oomph. When fresh, baking powder will fizz when you add a teaspoon a a glass of hot water – if it doesn’t then throw it and buy a new tub. Simply swap out the milk for coconut milk or any other non diary milk, and swap the butter for dairy free spread. Use apricot rather than mango compote. Swirl though some yogurt for an easy week night pudding / dessert. If you try this Easy Mango Pancakes please tag #FussFreeFlavours on Instagram or Twitter. It is amazing for me when for me when you make one of my recipes and I really do love to see them. You can also share it on my Facebook page. Please pin this recipe to Pinterest too! Thanks for reading Fuss Free Flavours! Easy to make mango pancakes are a super breakfast treat - my secret ingredient is a good quality mango compote. 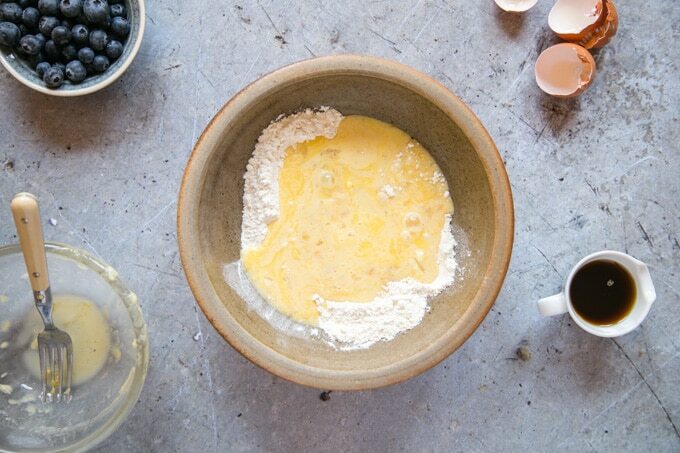 Mix together flour, baking powder, and salt in a large mixing bowl. Combine the milk, mango compote and eggs in a separate bowl and whisk together with a fork. Melt the butter in the microwave or in a small saucepan, and add to the milk mixture, stirring well. Pour the milk mixture into the flour mix and gently fold until combined and smooth with no lumps. If possible allow to stand for 30 minutes before cooking. 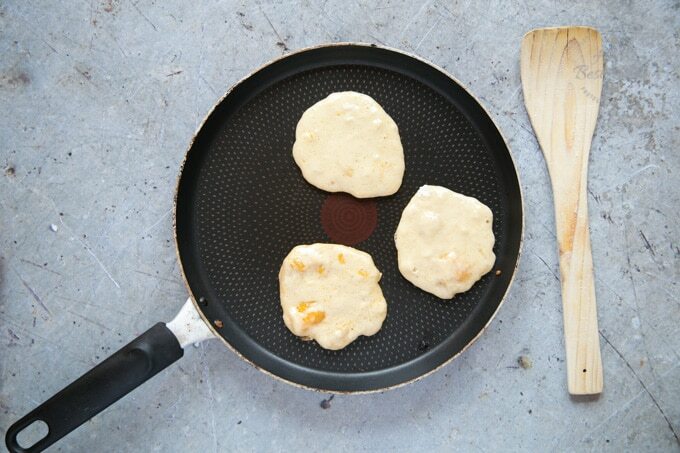 Warm a frying pan or flat griddle pan over a medium to low burner, and heat. use a piece of kitchen paper to spread a little butter over the pan. Spoon one tablespoon of batter per pancake into the pan. 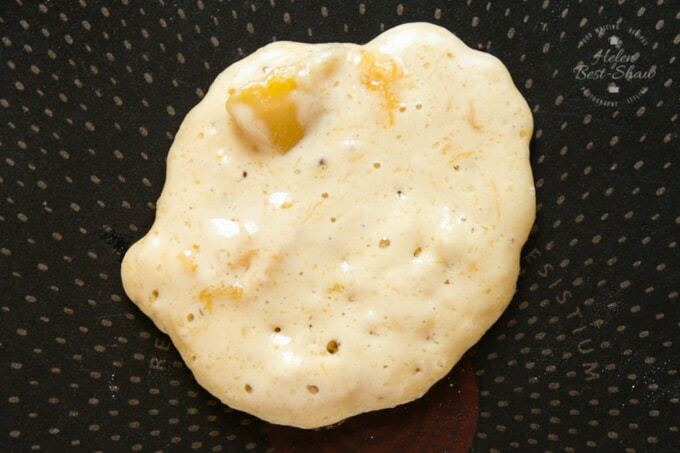 When bubbles can be seen on the top, the pancakes are ready to flip. Turn once and cook until the bottom is coloured brown. Keep warm in the oven by covering with a tea towel. Serve with more butter, blueberries and maple syrup. Use soft flour - so cake flour - NEVER strong bread flour. Use fresh baking powder. Baking powder has a shelf life of 9-12 months before it loses its oomph. When fresh, baking powder will fizz when you add a teaspoon a a glass of hot water - if it doesn't then throw it and buy a new tub. This recipe is 11 Weight Watchers Smart Points per portion.